"2017 MSA Profile by Woods & Poole Economics"
The MSA Profile has data for all established and newly-defined Metropolitan Areas in United States. The MSA Profile contains historical data by decade from 1970 and projections by decade to 2050 of population by age, race and Hispanic origin, employment by industry, earnings of employees by industry, personal income by source, households by income bracket, and retail sales by kind of business. The data and projections are for all Metropolitan Statistical Areas (MSAs), Consolidated Statistical Areas (CSAs), Micropolitan Statistical Areas, Metropolitan Divisions, states, and regions in the U.S. The 1,000+ page volume has more than 500,000 statistics. The volume includes a useful overview of the 2017 projections for the U.S. and the outlook for each of its four geographic regions, Northeast, Plains, Southeast, and West. There is also a thorough technical explanation of the data and projection methodology. Woods & Poole Economics, Inc. is an experienced, small, independent firm that specializes in long-term county economic and demographic projections. Woods & Poole has been making county projections since 1983. Users of Woods & Poole data include public utilities, state and local government, consultants, retailers, market research firms and planners. 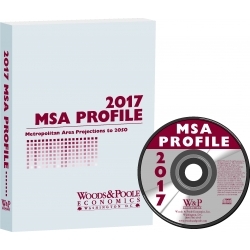 The MSA Profile data tables, and a pdf file of the printed book are also available on CD-ROM, and as a download file. Or, you can purchase a DVD that includes data tables for every county in the U.S. as well as all of the MSA Profile tables -- more than 35 Million statistics altogether. (see Format Options above).